Goa has long been known as the perfect beach wedding destination not only in India but the world over. Goa is blessed with a golden coastline of picturesque beaches. It is truly a heavenly experience to have the sea breeze blowing in your face and the sand kissing your feet on the biggest day of your married life. Your guests from all over the world wouldn’t think twice to come for a fun-filled holiday and grace your big day in Goa. Beach weddings however come with their own set of challenges which need to be met inorder to ensure that your event is hassle free. This includes a lot of logistical planning and organization. Special fixtures need to be setup like ramps, stages and carpeting to ensure better and safer movement of your guests on the sand. 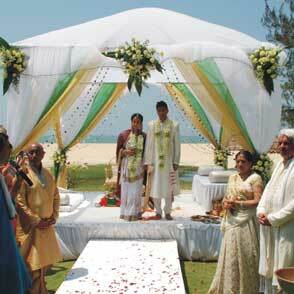 Wedding mandaps and canopies need to be installed appropriately to avoid strong winds. Protective tents need to be installed to cover your guests from the evening sun. Lighting & Sound also need to be adapted to the dynamic beach environment. Beaches in Goa cannot be privatized. They belong to the Government and are managed by the Department of Tourism in Goa. Therefore a special event license must be procured to organize any event on the beach. We can help you to get this license and have a legal beach wedding without any interference. 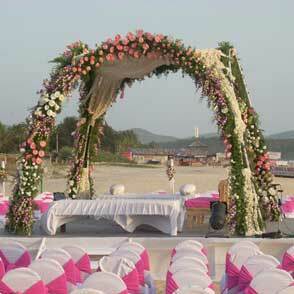 Goa Wedding Decorators are specialists in beach weddings. 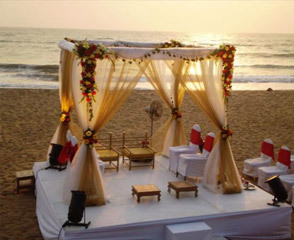 Besides our regular decorating services we can assure you that with our wide experience in Goan beach weddings we can give you the most hassle free experience at your beach wedding in Goa. Contact Us today for our beach wedding packages & prices.